Lake Como has long been a favourite destination of the rich and famous, from the patricians of the Roman era, Renaissance nobility, European royalty, wealthy industrialists, through to Hollywood stars. 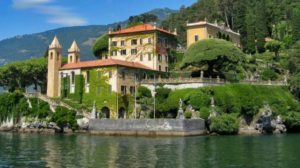 Each generation has left its mark by way of beautiful villas and gardens dotted all around the lake, some of which are now open to the public to enjoy, such as Villa Serbelloni, and Villa Melzi at Bellagio. 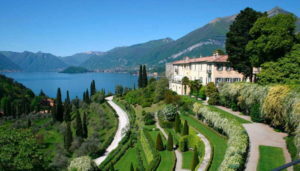 A number of other beautiful villas have been converted into luxury hotels or venues for private functions such as Villa Balbianello, near Bellagio. 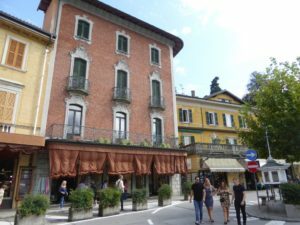 A visit to the 17th century Villa Carlotta at Tremezzo is one of the highlights of a sojourn on Lake Como Facing Bellagio, it’s only a couple of minutes by ferry across the lake. 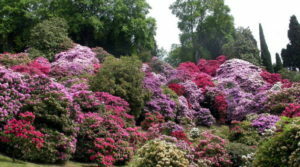 Famous for its magnificent botanical gardens, it’s an unforgettable sight when the masses of azaleas and rhododendrons are in bloom. As well, there are huge plane trees, sequoias, tropical plants, a fern valley and a bamboo garden. 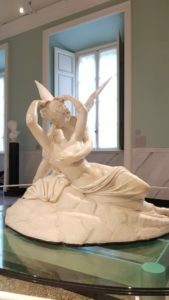 The villa also has a notable art collection, including numerous sculptures by artists such as Canova. Regular art exhibitions take place and there’s also a program of chamber music concerts. 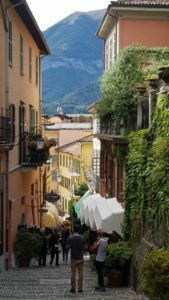 Situated on a hilly promontory jutting out into Lake Como, Bellagio is perfectly placed to explore the many picturesque little towns and resorts dotted around the lake. The most pleasant and easiest way to do this is by the local ferry services that criss-cross the lake, and almost every town has its own ferry wharf. Various combinations of tickets are sold whereby you can combine a couple of destinations or just point to point. 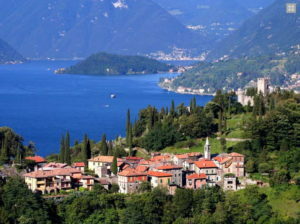 Conveniently located between the two branches of the lake, Bellagio is also serviced by car ferries that ply between a couple of towns, such as Varenna on one side of the lake and Cadenabbia on the other. 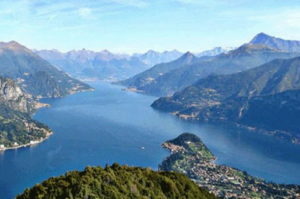 At the bottom of the lake is the town of Como, which makes a delightful day trip from Bellagio. This route is serviced by regular ferries as well as faster hydrofoils. The only advantage of the hydrofoils is that they’re quicker, but as the seating is down below, the small, water-splashed windows don’t offer a very scenic outlook. On the other hand, the slower ferries offer spectacular views from the interior seating and out on deck. 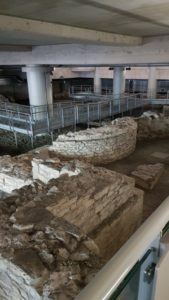 One of the fascinating things to see in Como is the large archaeological site of the Terme di Como Romana, located nowadays under the recently built multi-storey carpark—there’s good street signage to find it, and it’s free to visit. The stone ruins of the baths date from the 1st century CE, and it’s a very impressive sight. Its sheer size indicates how popular Como has been since ancient times. As the centre of Italian silk production, Como serves the world’s top fashion houses. 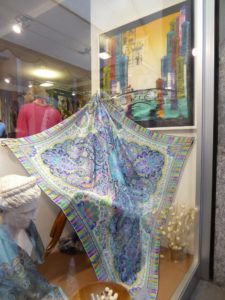 Shoppers will be pleased to know that there are many shops in the town selling beautiful silk scarves, ties and other related fashion items. The lake’s most famous sons were Pliny the Elder—natural philosopher, author, provincial governor, and naval and army commander, born in 23 CE—and his nephew Pliny the Younger—born around 61CE. A Roman Senatorial family of the aristocratic equestrian rank, they hailed from Novum Comum (Como). 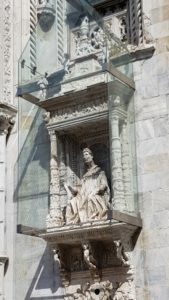 Both Plinys are commemorated by statues on either side of the main door of Santa Maria Maggiore, the Como Cathedral, where they sit in two niches below columns of stone saints and martyrs—interesting locations, given they were both pagans! Pliny the Younger loved villas. Being very wealthy, he owned several, such as one high on a hill overlooking Lake Como named ‘Tragedy’, and another named ‘Comedy’ which was lower down on the Lake’s shore. The location of both villas is uncertain, but Roman coins and a mosaic floor dating from Pliny’s era have been found in Lierna on the shores of Lake Como, and many scholars are convinced that this was the site of ‘Comedy’. Above the Villa Serbelloni in Bellagio are ancient Roman ruins still visible, thought to be ‘Tragedy’. 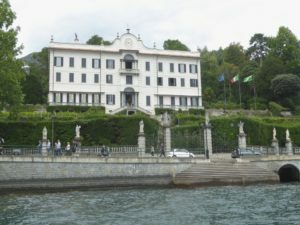 Villa Serbelloni is owned by the Rockefeller Foundation as a residence and meeting place for visiting scholars. 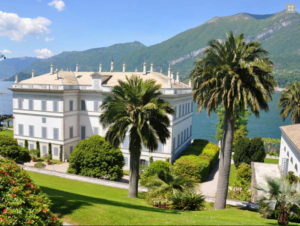 This is not to be confused with the mega-deluxe Grand Hotel Villa Serbelloni, where in past years, locals say that George Clooney could occasionally be spotted dining or enjoying a quiet drink. Well, perhaps…but it’s a nice thought! Running along the waterfront, the main promenade of Bellagio is populated by dozens of shops offering cafes and local food, leather goods, but especially high end boutiques for women’s and men’s fashion, jewellery and other accessories, particularly fine quality silk scarves and ties as well as home décor items. A network of narrow cobblestone streets branch off this road, with steeply sloping stone stairways heading to the upper reaches of the town. Lined with pretty flower boxes and potted plants, shops, restaurants and colourful houses, it’s easy to spend a couple of days exploring them. Halfway up one of the few streets with vehicular access is the pretty Piazza della Chiesa. 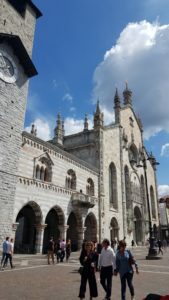 Dominated by the town’s 12th century Romanesque church, the Basilica di San Giacomo is worth a visit for its frescoes and statues, attractive bell tower and elegant apse. 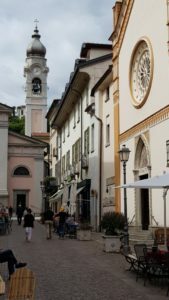 On the other side of the piazza is a medieval tower, once part of Bellagio’s now-disappeared defences, which is now the PromoBellagio tourist office. There is also a Tourist Information centre on the waterfront, next to the ferry wharf. Bellagio is the perfect location to enjoy the delights and charms of Lake Como, with its temperate climate, and magnificent gardens and villas. The breathtaking scenery can be enjoyed cruising around on the ferries that service the lake, gentle strolls or more energetic hiking. And of course, there’s lots of opportunities for relaxing with a coffee or an evening glass of prosecco at one of the lakeside cafes, as you take in the stunning view in front of you. Lovely, lovely – an absolute favorite. You recommended the Hotel Du Lac I think it was, which was straight across from the ferry wharf. We had a very enjoyable stay there for a few days and visited many nearby towns by ferry. The scenery was stunning and we hope to go back soon. Hi Cheryl. What a magnificent vista. You have certainly reinforced a long held ambition to visit Lake Como, just as you did on our visit to France where we were able to see Pont du Gard , near Uzes. How lovely to hear from you! 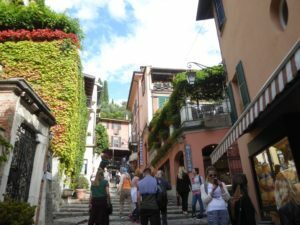 Yes, you must put Lake Como, and Bellagio specifically, on your Must Do list. It’s location is the best, of all the lovely little towns dotted around the lake, and so incredibly beautiful too. 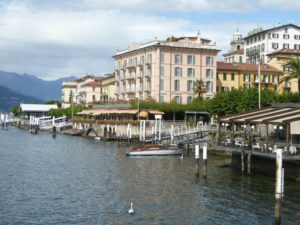 Would highly recommend the Hotel du Lac, which is right opposite the ferry wharf, so you can catch a ferry up from the town of Como, right to the front door, virtually, of the hotel. As I know you both, I’m sure I can guarantee you’d love it! Hope this finds you both well, and we must catch up soon–it’s been too long!